With this travel apps you have a WEBCAM/MAPS with directions (location and route) functions. 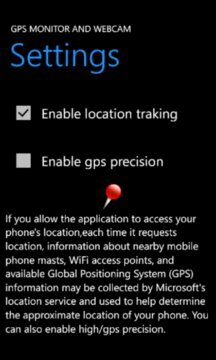 On a wp8 device you can launch NOKIA HERE DRIVE, NOKIA HERE MAPS, NOKIA HERE TRANSIT, gMaps APPS. You can find point of interest or set d/a point on the drive navigator apps (usefull for tourism or search restaurant, hotel, shop). You can set your departure and arrival point and then calculate your route. To set the departure point use the left icon. To set the arrival point you have two way. 1) On the map HOLD on a point and then TAP "Add new destination". 2) Through the search button you can find an arrival point in text mode. After you added the d/a points you can tap on the right icon to trace route on the map. The web cam are retrieved through webcams.travel. It is a service designed to offer users, the ability to view world web cam, of the touristic places par excellence. For holiday/vacation or to discover new places as city (also useful to see meteo/weather or traffic info). When you add a destination the apps will show many options among which: route trace details and webcan nearby destination. One show a route from your position to the selected destination the other show a list of webcam nearby the destination selected. You have a search of webcam function through map gesture, then launch here app. In the home page you have also a list with the news, popular, nearby you webcam. You can scroll the list, if you tap on an a webcam/item, it will be opened a new page with the webcam detail. For every webcam you can show a map with the position, if you wish you can trace a route from your position to the web cam position. In this second map the destination position is present then you can not change. If you wish, you can send a route/map by email using bing or google format. Save webcam image into your phone's photo list. There are also web cam bookmark. There is also a compass that show you current direction. 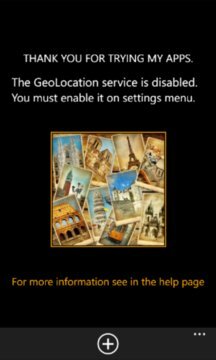 If you are a tourist, this app will be useful to the holidays and leisure time. Or on your travels to discover places or touristic city. On a wp8 device you have meteo/weather condition and forecast.